With less than a week until the Drukhari codex is here, I thought I’d take a look back at my time with the Index during 8th edition, and have a sort of general ramble about what I like about the army. Without a doubt, Drukhari are my favourite 40k army to play, from that very first game against Blood Angels, even through playing against a horde of Orks. They’re just fun. 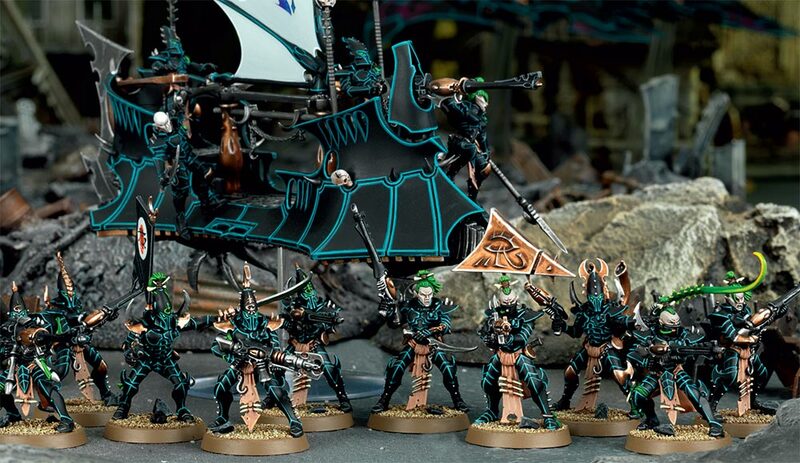 Necrons will always be my first love, of course, but Drukhari are my favourite! The overwhelming thing that I like most about the Drukhari has got to be the variety of flavours you get when you pick this force. Natively, you get three very distinct factions within the overall army: Kabals, Wych Cults, and Haemonculus Covens, which service your need for speed and bullets, up-close murder, and genetic experimentation, respectively. In addition, there are various strands of mercenaries available, such as Scourges and Incubi. Due to the way keywords work in 8th, however, we also share the Aeldari keyword with Craftworlds and Harlequins, allowing for a blend of different stuff in the same list, as well as Ynnari being a similar, though more stringent mix of the same. I’ve only ever been tempted by Harlequins, as they seem to share some traits with their dark cousins. There’s something about the Craftworlds that puts me off, and Ynnari just feels far too cheesy to even start thinking about them. That said, plenty of people like to mix and match their detachments in order to plug holes that the Drukhari inherently have (mainly psyker support) and there’s nothing wrong with having your fun as you like it. For me, I tend to prefer to try and work around things like this within the scope of the force, relishing the handicaps as part of the theme. Throughout 8th edition, I’ve stuck quite closely to the same mix of Kabals and Covens, with varying degrees of Wych Cults peppered through. It’s done me quite well up to now, and is what I’m going to be rambling about here today! My armies have always been Kabal-centric, as I started this journey with the Start Collecting box back in the day, but the core of Kabalite Warriors can provide a really cheap start for your force. My first squad of ten Warriors was armed pretty basic, just using a splinter pistol/agoniser for the Sybarite, and a splinter cannon for one of my dudes – and that comes to just 89 points for a ten-man squad. Of course, throwing in a Raider to move them about is where things tend to get expensive, but even so, Drukhari armies can tend to be full of people if you go for quite a bare-bones approach, allowing for ablative wounds aplenty. Warriors with Dark Lances are something I’ve tended to shy away from. Don’t get me wrong, I’ve built some for the hell of it, but it makes me itch having a 20-point weapon on a 1 wound, 7-point model. I’ve always found it more expedient to mount dark lances on Raiders, to make them Assault weapons as opposed to Heavy weapons, and be done with. Furthermore, 8th edition has seen a great need for weight of fire, and dark lances are Heavy 1. Splinter cannons, the other heavy weapon in the Warrior build, are Rapid Fire 3, giving you 6 shots when in rapid fire range, rather than 1 shot total. Sure, the dark lance feels like a proper heavy weapon, but I think the chance of whiffing with a dark lance is just too much for its cost. Trueborn aren’t something I’ve taken often, though I do like the loadout of a five man squad in a Venom, with two splinter cannons and two blasters. Arming all four with blasters, and giving the Dracon a blast pistol, was quickly decided as “the best” strategy for these guys, and Blasterborn was quite the thing in the early days. I even built some myself, feeling the pressure get to me! But the rumours have pretty much confirmed that Kabalite Trueborn are no longer a thing, instead providing more upgrade options for basic Warriors. I find that interesting, as it was always a facet of the army that I quite enjoyed – while they don’t technically have a kit, I don’t really see it as that different to the fact that Lychguard are technically built out of the Triarch Praetorian kit; the only difference here is that the Kabalite Warriors box doesn’t tell you it can also be built as Trueborn. (The basic squad loadout for Trueborn is with splinter rifles, so I don’t see why they should be penalised for not including four blasters in there). For me, I think I’ll always be a fan of the Venom. It can only transport 5 models rather than 10, but I love the sleek little craft with their splinter cannons, zipping around the field and shrugging off a lot of fire due to their Flickerfields. A Venom with two splinter cannons is as expensive as a Raider before the weapons, however, but as a transport for my Archon and selected members of his Court, I do like it. Speaking of the Archons, I’ve forever been unimpressed with this model, and indeed have often seen it as a tax for taking a battleforged army. The one time I had him do anything, he did kill an Ork warboss, so I suppose he’s not all bad, but mainly I tend to just forget about him and concentrate on the main event, the Warriors and other bits… The Court is something that I have rarely used, and can’t really offer too much of an opinion on. I only have the Lhamaean painted, and have included her more as ablative wounds for the Archon, should it ever come to that. I think I’d like to try and play the Archon more as a melee option, generally, and so surrounding him with a Court might be an interesting possibility. Stay tuned for that one, then! Let’s move on to Wych Cults, though! I’ve not really had a great deal of use for these, as I have been playing a lot of melee-heavy armies so far in 8th, and Wyches are just not a good option for that. 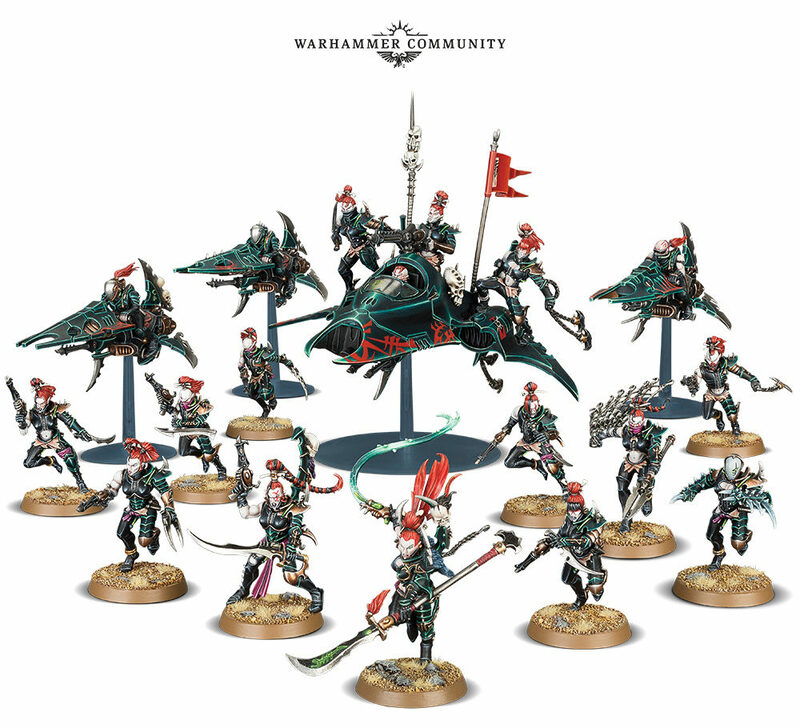 For sure, they’re touted as the close combat specialists of the Drukhari, but they’re a unit that you want to use to tie up other units that don’t want to be in close combat with you. Necron Immortals, for example, are pretty useless in melee, and want to be out shooting you with tesla. Charge them with Wyches, and they’re pretty much taken out of the fight, no matter what else happens. Against a unit that also wants to be in melee, however, they’re really quite bad at T3. This is, I suppose, where Combat Drugs come into the mix. Getting to choose your unit’s drug for the game is handy, for sure, but the basic Wyches could definitely use some ability that gives them more than one. But I digress. I’ve had better success with Reavers, giving them Adrenalight for three attacks each. The only problem, however, is that Reavers are massively over-costed for what they can do. At a base 90 points for a squad of three, you want to think carefully about upgrading them in any way, and unfortunately, my own squad of them runs to 120 due to adding in a heat lance and cluster caltrops. They are a much better option for getting into close combat, however, and despite their speed, that’s really where they want to be – I guess the speed is only there to get them into combat so much sooner! All Wych Cult units want to be in melee to some degree, of course, but the Reavers and the Hellions are probably the two that are best placed to do so. Reavers have a lot of tricks that really point to what they want to do, and to some extent the same is true of Hellions. A base squad of Hellions is 95 points, but if you stick Adrenalight on them, you’re making twelve attacks on a five wound unit, rather than ten attacks on a six wound unit. Weight of fire would suggest the Hellions are the way to go, but people always seem intent on ignoring the skyboard-flying gangers! I’ve only used them once, but their Hit and Run rule, allowing them to fall back and charge in the same turn, is really something to bear in mind when using these guys. The leader of these Cults is, of course, the Succubus, a model that I really like the look of, but have never found to be all that useful due to (a) not running Wych Cult-heavy lists, and (b) the fact she can’t really keep up with those Wych Cult units I do run, without buying her a Venom. At 72 points, she’s a little on the expensive side for an HQ that I don’t get a lot of use out of, so I tend to treat her quite carefully overall. Finally, let’s take a look at the Covens! 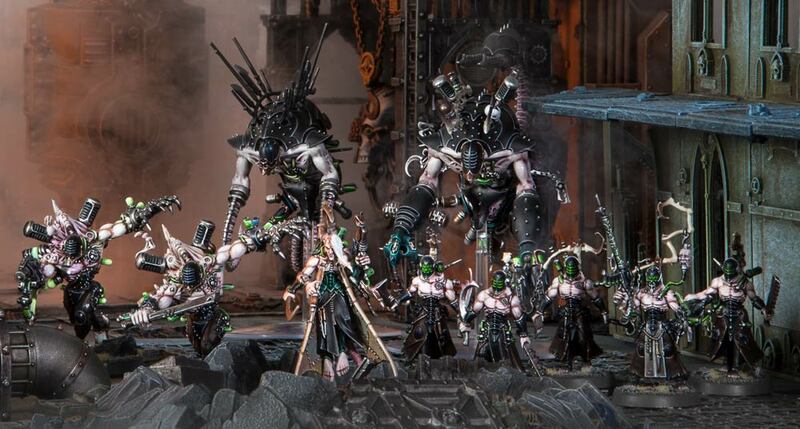 These chaps are something I’d initially not expected to be adding to my army, as I wanted a Kabal/Cult list, but I quickly changed my mind when I built my first box of Wracks. This kit single-handedly convinced me that I needed some Coven action in my life, and I quickly added a number of the other Haemonculus units to my army. The two pain/parasite engines are beautiful, for all that they’re quite disgusting, and the whole look of these guys is just so alien and other-worldly, I love the effect of seeing them amid the regular Kabalite force as something of a freakish centrepiece! Coven units want to be in close combat as well, though I feel they provide a much more well-rounded section to the list that they stand on their own much better. All Kabalites want to do is shoot; Wyches try to shoot and punch, but they end up lacking the firepower to do the former, while being too weak at the latter. Covens, on the other hand, have an interesting array of guns for Wracks, as well as the Talos that can act as something of a gun platform, while all the units are also really quite good in melee. The Haemonculus is a really good choice of HQ, and can be customised to your tastes much better, it feels, than an Archon or Succubus. He is also the only answer to psykers in the entire army, bringing a Crucible of Malediction that allows him to dish out mortal wounds to nearby psykers once per battle. It’s not great, but it’s all we’ve got! As a side note, it’s a shame that the Cronos doesn’t have something similar, but there we are. I like fielding big units of Wracks, though it is worth noting that a unit of 10 costs 110 points before you start adding in their fancy guns. The ossefactor has often been thought of as the best, due to the range and mortal wounds it gives out, though I do like the Hexrifle for picking off characters. For 11 points, it has the potential to snipe characters for two wounds, though it is a Heavy weapon on a slow-moving unit, so there is that to consider. 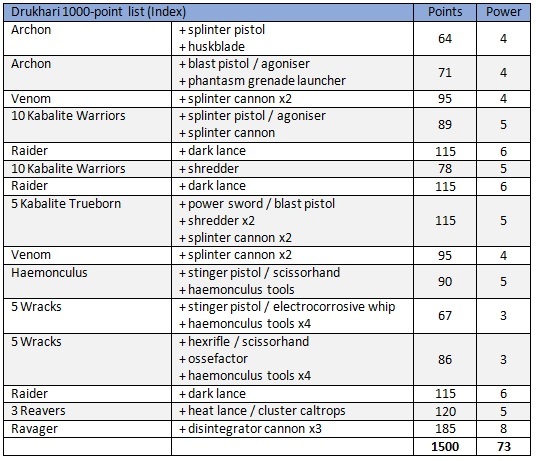 Without a doubt, I’ve had some of the most fun games of 8th edition fielding a blend of Kabal and Coven, and so to close here, I thought I’d share my go-to army list with you all, with the Index points costs while we’re on the eve of the new Codex. I think I’ll revisit this once I have the book in hand, and will doubtless be rambling some more with my thoughts on building an army with the Codex!